President Robert Mugabe, has thanked Zimbabweans for securing and defending the country's heritage by voting overwhelmingly for his party Zanu PF. 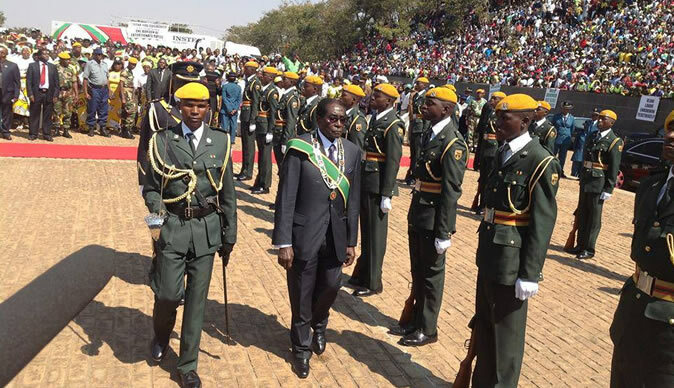 Addressing thousands who thronged the National Sports Stadium for this year's Heroes Day commemorations President Mugabe said the celebrations are two-pronged in that on one side, they are in honour of the gallant sons and daughters of the soil who gave their lives for independence. On the other side, the celebrations, said the President, are a sign of commitment by the people of Zimbabwe to continue safeguarding and defending the heritage and land that the departed and living heroes of the struggle fought for. "At some point sell-outs emerged from amongst us - those who allowed themselves to be used by our erstwhile colonisers to take our land from us. But we thank the people of Zimbabwe and truly we fought hard and we won. "We shall continue to defend our inheritance. We will not let it go. This is the vow we make. Our strength is in our unity. Our strength is in our vote, not in the barrel of the gun anymore," said Mugabe. He added, "We thank you for the work you did and for coming to homour those who led in delivering the inheritance we have. Let us continue peacefully together with one mind and in truth. The path set before us is one of commitment and truth. No lies. This is our land. It does not belong to foreigners. President Mugabe said the power to choose leaders is vested only in the people of Zimbabwe. "So we are the creators of government. We are also the creators of peace in this country. It is our duty to fend for ourselves. This is what God willed that we belong to Zimbabwe. Daily we thank Him for what he bestowed upon us and we defend our inheritance." To the opposition and their masters he added, "We voted democratically. We brought democracy. We are delivering democracy on a platter. Do you take it? We say take it or leave it, but the people have delivered it. And forward ever, never will we go back on our victory. We know no defeat." "Those who can not swallow defeat should just go and die. If they want to go hang it is their choice, but even dogs will not sniff at their carcasses," he said. "This year's celebrations come in the aftermath of two historic landmarks - the conclusion of the constitution and the successful holding of the harmonised elections which we have won. Prove them wrong those who doubted that Zimbabweans are not able to run their affairs without external interference. We did it as Zimbabweans. We did it in a peaceful way. We did it in a united way." He thanked all political parties, churches and the rest of Zimbabweans for the peace that prevailed before, during and after elections. "Let me also take this opportunity to thank our regional and internal organisations which include SADC, COMESA and the AU respectively, who have continued to support our national efforts. My gratitude indeed also goes to all those friendly countries which always wish us well and on this occasion also wished us well." He urged Zimbabweans to remain united and foster development. "Let me now end by saying let us put our strength on taking this country forward. To feed your self you must prepare the land for yourself. And to be able to do that we should be able to say 'we own the land' so that we can fend for ourselves. Let us be united. Let us continue in morality and we should be vigilant in protecting our land, knowing that the enemy wants us to sleep so that he takes over." "Let us guard against imperialistic tendencies, which are always subtle."